Our jet lag recovery once back from Europe this year was the easiest we've ever had. It was in part due to finally following the advice of being well rested before traveling. Like most travelers, we are usually in a controlled state of panic before we fly. Wrapping up the last details, deciding what isn’t going to get done, and dealing with unexpected problems always has us in a tizzy in the final days and hours before departure, no matter which direction we are heading. And because of that generalized stress, our sleep always suffers. But this year, more by accident than design, we had a tranquil last week before making the trans-Atlantic flight from Frankfurt. We were calm in the days preceding our flight, which meant we slept more deeply at night. Handlebar bags & other 2008 sewing projects. The benefits of being more rested before flying were seen immediately in our improved productivity. Our level of functioning the first day and days after arriving home was phenomenally higher than ever before. My long list of mindless chores to be done in the engulfing fog our first days at home was ignored; we jumped right into the more important and more difficult business tasks and sewing projects. Two months later most of those little mindless chores, like filing the rough edges off our 2 new Lexan spoons and packaging pills into tight bundles, were still waiting to be done. Bill availed himself of nightly doses of his prescription Lunesta sleep aids for a week to keep his productivity high. I only used the Lunesta the first 2 nights then switched to the less effective but substantially cheaper herbal sleep aid Valerian. And I think because my sleep situation wasn’t so desperate this year, I could sense that the melatonin doses were speeding my recovery. I know many people find melatonin to be a potent sleep aid but I think it only assists me in resetting my biological clock. So, after 14 bouts of jet lag in the last 7 years, we think we are finally getting the upper hand on this nasty nine hour time zone adjustment process. . 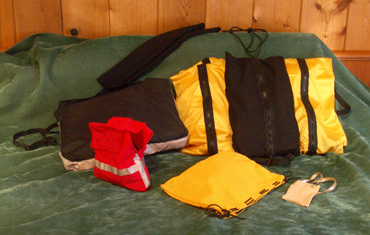 Purchased gear that we subjected to sewing alterations. The lack of easy access to a car this year increased our need for clear thinking upon arrival and pushed us to new levels of boldness and creativity. Our first days back in the country found us asking friends for rides to or from Christmas parties. Our “everybody has a car” culture meant that we were very unpracticed (and uncomfortable) when asking for rides but we were overwhelmed by people’s generosity. The several times we asked, we were immediately accommodated, which helped us immensely in getting to suburban locations. Many times during our stay friends and neighbors said to ask if we needed a lift, that they’d happily help us out. We were stunned and comforted by the many generous offers. Thank you again to those of you who offered us a ride or use of your car, whether we accepted or not. In addition to being bolder about asking for help, we also became more creative in developing our own “Park & Ride” situations. Our former home that has been a rental for the last 7 years was vacant so one day I biked to our house, locked my bike inside the storage shed, and then took the bus the next 5 miles to the big-box Costco store. I was too familiar with pedaling alongside the adjacent the highway traffic and happily made the last half of the trip by bus. Of course, it dramatically reduced what I could carry home but most of $200 in purchases were planned to be compact medicinal supplies and media chips. This compromise allowed me to run the errand and get my exercise for the day but without experiencing the dreariest part of the bike route. Our bikes & share-cars were among our transportation options. Our greater transportation needs this year also pushed us to be a little more reckless about parking our unattended bikes on the city streets for short visits to the bank and post office. Usually we don’t leave the little darlings alone on the street, but we successfully pushed out our comfort zone by using careful site selection and extra locks. Even though these were our retired, first pair of touring bikes, they are too expensive to give away. Longer stops at the Trader Joes grocery store still found Bill being bike sentinel as he often is in Europe. We needed his extra carrying capacity and, like in Europe, he busied himself with minor bike chores or reading while I shopped. And as when overseas, we often positioned him indoors with an eye on the bikes because of the harsh weather this winter. 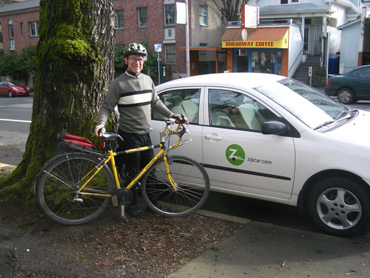 Our new transportation needs also prompted us to become members of Flexcar (now Zipcar), the car-sharing company in our area. We had hoped to use the service as soon as we arrived but it took several weeks to complete the membership process. The share-cars generally cost about $9/hr, which added up quickly, but we reconciled ourselves to it being a fair price for our situation. The price stung more when we used it for an evening with friends as the meter was running when the car was not. But the all-inclusiveness of the fee schedule felt grand the couple of days when we selected the discounted day-rate ($65). Then we clustered our activities, like running miscellaneous errands and taking my mother to the doctor or shopping. On our most efficient day, we topped the car usage off by visiting suburban friends in the evening, which felt like turning the meter off altogether. As in the past, we used public transportation several times a week. Bill's efforts at downloading the entire bus and metro system schedules onto our handheld computers produced awesome results. The well designed system required a rudimentary knowledge of the city streets but with that we could locate a nearby bus stop on a whim. We didn't use our electronic schedules often but they moved our bus trips from being a carefully planned outings to being spontaneous activities. And a fellow rider early in our stay showed us how to easily use a cell phone to track the bus one was waiting for--a nice feature on the cold days. And of course, we walked and walked some more while at home. I kept my “walk for transportation” within the 10 mile, round-trip range and managed to get my targeted 2 hours of exercise outdoors almost everyday. I again loved using our telescoping trekking poles to keep my both pace and posture up. The few times people looked at my poles and inquired as to “Why?” I added “and it makes people laugh” to the list of benefits. Ah, if I had a nickel for every ski-pole wisecrack tossed my way as I walked….. 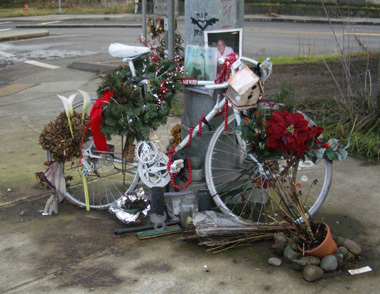 The ghost bike memorial to #6 in 2008. We have a running joke as to how many repetitions of an event it takes to count as a pattern worth noting and perhaps reacting to. The basis of the joke is that for me, the second time it happens, it’s time to factor it in or make a change. For Bill, 5 times is the magic number. In Portland, it unfortunately took knocking-off 6 bicyclists in 1 year, with numbers 5 and 6 occurring within 2 weeks of each other, to trigger change. But boy, did it ever. When at home the last several years, we personally felt the mounting hostility that an increasing number of motorists exhibited towards cyclists. Verbal assaults at us and physical altercations between other cyclists and motorists were on the rise. But this year, arriving on the heels of the latest deaths, we were treated with kid gloves by the drivers. “No, no, you go first” was often the hand gesture from behind the wheel when at intersections, even when the motorist had the right of way. Some drivers seem to shrink and withdraw at the sight of us, like a superstitious person encountering a death omen. We reveled in the courtesy but felt a little sheepish at the excessive deference, especially since some motorists were potentially creating a hazard by stopping for us when we should be yielding. "Enjoy it while it lasts and return the courtesy" was all we could do. Hopefully the planned pavement markings giving cyclists a safety area at intersections will solve the problem. Almost all of the deaths occurred in the “right hook” situation when a motorist was turning right while the curbside cyclist was continuing forward--the new boxes should get cyclists out of motorists' blind spots. Being back on our bikes in Portland is always a treasure hunt as we look for what is new in the city-supported bike services. This year we were amused to see our first double-wide bike lane in town. Apparently the pack is thick enough (and the roadway wide enough) to warrant 2 side-by-side bike lanes heading west over the Hawthorne Bridge. Very classy. One of the new in-street bike corrals. 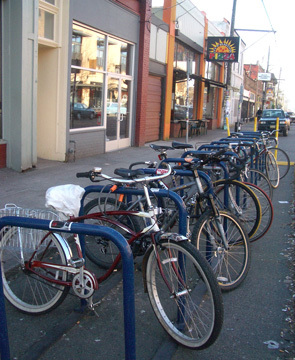 I did a double take upon seeing 2 pairs of 2 or 3 car parking spaces on SE Belmont St converted into formidable bike parking corrals. And although the delightful East Side Esplanade along the Willamette River opened just before we started traveling in 2001, this was the first year we managed to include it in our weekly, 25 mile round-trip commute between Portland and Vancouver. One of these days we were on the floating dock portion of the Esplanade with some of the 2,000-strong pack of "Worst Day of the Year Ride" cyclists. "Keep Portland Weird" is a slogan that sprung up after we began traveling and the biking community is holding up their end. 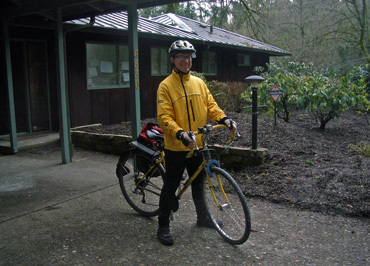 The gray-hairs like us are well represented on fine bikes wearing high-visibility yellow jackets and carefully selected gear for the often unpleasant conditions (it snowed on 2 of our bike-commuting days). In contrast the younger set, especially the males, were working hard at being retro or outrageous rather than athletic or practical. One young man pedaled by us with his bull dog on his back. Little more than the rear end of the dog was supported in the old canvas book bag slung over his shoulder. "Dad" reached over his own shoulder with one hand to hold the dog's front leg. Our sport's injury orientation had us immediately being concerned for the long-term health of the dog's shoulder. We were also left wondering which of the 2 would fair the worst in a dicey situation. But at least in the moment we saw them, both were at ease with the customized solution to their transportation challenges. A pair of guys looked retro-European in their upright riding positions on their new black city bikes with double top tubes. One had an enormous wicker basket mounted over the front wheel. This was no cute little thing for a puppy but was closer to a steamer-trunk in size. His broad brimmed black hat completed his costume on this rare, fair-weather winter day. Serious hauling along the Willamette River a day after it snowed. Other European favorites are slipping into the Portland biking scene, like the wooden toddler bikes without pedals. Kids learn to balance on the seat while they waddle along with both feet and occasionally coast when they pick-up some speed. One new shop is now importing Dutch utility bikes, so there has been a big jump in the number of bikes on the streets with serious hauling capacity. 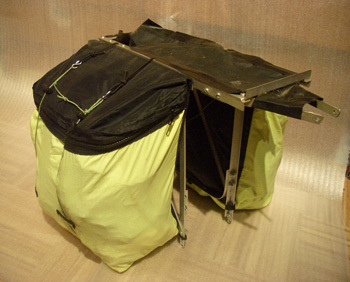 These are bikes with stretched frames that have low-riding cargo areas either in front or in back with a few having 2 wooden compartments for commuter kids. The 'weird' convention that is becoming too popular to qualify as weird much longer is the high-bike. These bikes seem to be assembled with reckless abandon--just enough sloppy welding of mismatched parts to hold the whole thing together. The saddle and peddles are about car-top height. After the tricky balance has been mastered, having only 1 gear and no brakes keeps the excitement level high as the rider wonders if it will snap in two. A blasé expression and scruffy street wear seem to be essential parts of the total look. I’m sure that these tiresome paperwork loops that service providers have us all running are not unique to our culture, but it seems like it’s time for a citizens revolt. A reform was triggered years ago in response to the growing need for legal documents to be written in more direct language; now it seems like pressure needs to be put on offices to streamline their paperwork interface with their clients. Being brief annual visitors to our own culture gives us a new perspective on it and clearly the silliness of paperwork and other processes is one of the insidious sources of stress and low-grade abuse in our daily lives. It seems like the wizardry of computers is being underutilized as it is so easy to edit and refine documents. It seems to me that there is no longer any excuse for putting circuitous, redundant paperwork before patients and clients. In Europe I often withhold the impulse to correct the English translations; at home I had to control my mental red editing pen that itched to redesign forms. 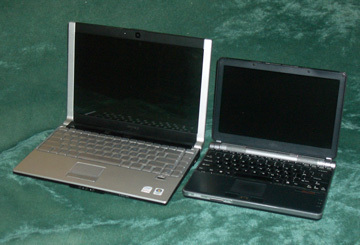 The new laptop is bigger & caused big headaches. My search for a better tolerated treatment for my recently diagnosed esophageal ulcer had me ranting and raving over absurd doctor’s forms and insurance headaches. In contrast, Bill’s “Why can’t they….” comments were flung at the electronics world. Luckily for all of us he is generally quieter than me as his aggravations were substantially greater. Bill’s daily routine for more than the first month of our stay was to sit in front of the new laptop for hours each morning, with the first stint starting before breakfast. The newer Microsoft Vista operating system created havoc for him. Transferring files from the old computer to the new; establishing back-up files on the laptop from the new PDA’s; and compatibility issues with the new, free wifi cloud in the neighborhood had him exhausting his seemingly endless patience. Nothing was simple and nothing worked right the first time; phone calls were made and products were returned. My computer needs at home are usually meager as I am mainly using it to keep up on emails. But as the weeks of Bill's intense concentration went on, I grew impatient for more time online that it took Bill to shower. Not that Bill was trapped in front of the screen all day, but I was gone many hours most days walking to appointments and doing errands and that left me with small windows of time to mesh with his breaks. Snapping Mom’s picture with my new smart phone was a breeze. But as the weeks ticked off, I counseled myself on being patient as I knew that though he says little about it, many extra hours were spent in my behalf. I’m definitely a 'kept woman' when it comes to the electronics as Bill selects hardware and software with my temperament and needs in mind and then further customizes them for me. I restlessly waited, knowing the process might not be completed by the time we left town, but the final product would again be wonderful. Unfortunately the computer problems, especially with the new Vista software, would intrude on our traveling lives for months. But lucky Bill: in the new hardware/software process, he picked up an additional title for his dormant CV. Yes, Bill is now registered as a "Motodev" or Motorola Developer. Signing on as a developer was the only way to access deeply buried details needed to solve compatibility issues between his new Germany-marketed Motorola cell phone and the new Vista operating system. The stakes were high as this was the special phone that would allow him to connect to the internet in Europe--the identical phones sold for the US market wouldn't work. Of course, despite the aggravations from the many practical matters, one of the joys of being back home is connecting with family and friends. As is always the case, some friends drifted farther away and others were drawn closer this year. And surprisingly, I ran into more old acquaintances in waiting rooms and in front of elevators than I usually do, which was delightful. Another delightful evening at Randal's. I’ve been amused to see that part of the community connections that I'm drawn to nurture when at home are those with favorite small retailers. For those of you in Portland who know the haunts, it’s places like RiverCity Bikes, Mountain Soles, and Rose City Textiles where we find ourselves chatting with the owner/operators or with long time employees. Those are more superficial contacts than with other friends and family, but it’s nice to see that the broader social fabric of our lives still exists and that not everything changes while we are away. I never expected to be immersed in aging issues in my early and mid 50's as I thought those matters wouldn't hit for at least another decade. But over and over again I am reminded of how wrong I was. 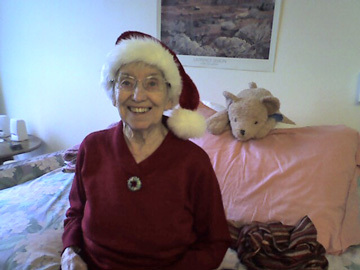 This year when at home talking with friends, it became clear that mental health issues take a turn for the worse with aging, along with everything else. We had assumed that tending to one's mental health with aging was focused on keeping the brain challenged and stimulated and preventing one's emotional baggage from piling too high. But conversations with friends revealed that many families were facing greater challenges, such as pre-existing mental illness becoming more severe with aging. Several friends spoke of parents whose manageable mental illness became unmanageable in the later years; others talked of the difficulty in sorting out a worsening of a pre-existing mental condition from the onset of dementia. 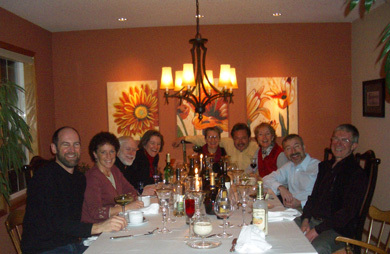 The bright side of the conversations was that despite the downward spiral that some people experience as aging impacts their less than optimal mental health, others were beating the odds and improving as they aged with the help of the tide of new medications. Though sadly, some spoke of parents who refused to take the medications offered. Just like our travels develop themes, so do our stays at home and this year the theme was learning more about mental health from other people's experiences. We'd previously come to understand how prevalent depression is but it was an eye-opener to learn just how many people have one or more in their household or extended families that are dealing with life-limiting mental health challenges. I've always found homecomings to be an opportunity for self-confrontation, whether returning from a day at work, a weekend at the beach, or as now, when we make our annual trek Stateside. The longer the time away from the familiar and the routine, the greater the potential depth of the inner journey upon return. "Adios" to the last of our home-made touring racks & bags. I still remember walking in our front door after a trip to the beach and noticing the distinctive, though ordinary odors of the house that were no longer normal to me. It was a potent but simple lesson on how much one accommodates to the familiar and how odd it can look (or smell) with even a little distance. In the same way, when we return after months of traveling I may look at a garment and find myself thinking "I used to wear that?" This process of coming back after an absence offers an easy entree into critical review and this year while at home we took a deep breath and accepted more of the opportunities than we pushed away. Some reviews of our stored past came uninvited, like the day I sewed 7 year old elastic still in its wrapper into the waistband of an old garment and it turned limp with the first wearing. The elastic had self-destructed in the years of storage despite being unused. Tossing his 'deep storage' underwear in the washing machine was enough to reveal to Bill that the elastic in his old garments had also slowly disintegrated in the drawer. Our stored belongings, like us, were showing their age no matter how gently used and we didn't like the reminder. Bravely delving into boxes of carefully stored items exposed a fine, non-digital camera; an early model of a cell phone; a VHS player; and a 'boom box' that were now all obsolete technology. Only the camera had any chance of being cherished by a new owner as the other treasures were now electronic junk. As hard as we'd tried to be good stewards of objects, we had failed with these, we held them too long for anticipated future opportunities that never happened. Our new life as cyclotourists had been too fun and was lasting too long for many of our stored items to be useful again. Confronting the aging of our belongings brought another unwelcome realization: our decision criteria set 7 years ago for what we were hanging onto was now obsolete. It was time to re-evaluate our criteria and devise a more aggressive plan for culling our stored possessions. My mother's dinnertime phone call alerting us to a "free shredding day" came on the heels of recognizing the need to reposition ourselves relative to our belongings. The shredding event was sponsored by a local TV station and we jumped at the chance to sort and shred in an 18 hour span. Here it wasn't necessary to develop a plan, it was just react, "Just do it". The short time line meant we could totally bypass the "should but don't want to" phase. The tedious work of sorting documents was an unwelcome intrusion into our evening but at the same time it was exhilarating to dispatch 2 boxes of old files. Our last big paperwork purge had been 7 years ago, just before we started traveling, so many files were ripe for plucking and pitching. This particular confrontation with our stuff had come and gone in a flash and we considered it a bonus--thanks Mom. This year's paperwork purge was impromptu but I had returned home intent on confronting my "top drawer" mess. This was my top dresser drawer that is the repository for both the precious and little "woulda/coulda/shoulda" possessions. Intermingled with earrings and voter's registration cards were a couple of $15 watches in need of a new batteries, old eye glasses and too many free glasses cases, and smaller things I couldn't ever quite decide what to do with. This particular drawer had traveled intact in the rush from our home to our new abode and had only been added to during our annual visits. It was daunting but symbolic to confront the "top drawer" challenge. But finally my earrings were well organized, all the odds and ends of postage stamps were together in a little bag (including a roll of "D" stamps from the late '80's), and the severely culled items were now only 1 layer deep. I took my bolstered courage to the other junky drawer, the one that had collected all of the medicine cabinet miscellanea the day we left the house. It too yielded to order after being enshrined in chaos for 7 years. Leaving our former home for the last time. The 'top drawers' were the relatively minor though highly symbolic challenges we took on but we also came to town anticipating a huge show-down: we positioned ourselves to put our former home on the market. It was terrible timing given the recent subprime mortgage crisis, but it was the right time from an emotional-needs perspective. Bill had repeatedly consulted our accountant in the fall and worked out a half dozen buy-hold scenarios from a tax perspective. Finally, the emotional needs won out. Renting the house had been a satisfactory but not a grand solution. The care of the house had suffered and the deferred maintenance had accumulated in unexpected ways. The monetary and emotional costs of holding on to our home were now overwhelming the emotional security needs of retaining it--it was time to let go. It was time for us to move on and it was time for this house in the urban forest flanked by bike lanes to enchant new owners. It was a difficult process to arrive at the 'sell' decision but of course, now that we've made the decision, we hope it sells quickly. Count-down for our departure back to Europe is always a mixture of conflict and excitement. It is always hard to judge how well we are doing with our chores and there are always unexpected pressures at the end. For me, the zinger was bowing to the wishes of my new GI doc in having an endoscopy 8 days before we flew and then cramming in a follow-up office visit on his day off 48 hours before we headed for the airport. Needless to say, none of that was anticipated but at least we were both doing enough better with our 'must-do' activities this year that we could squeeze it all in without a crisis. Silly problems with the pharmacy also added more tension to our wrap-up time than we appreciated. And then there was watching the mail in hopes that the last of the anticipated items would arrive so as to simplify finalizing our business matters. Times like these always make me think of bungee-jumpers: I seem to get enough adrenaline rushes from dealing with daily life without paying extra for my biochemical surges. 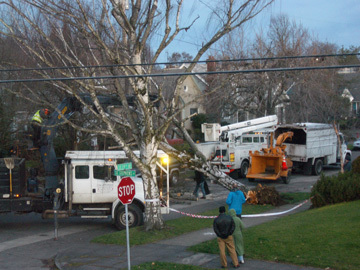 Winter weather: a neighbor's tree came down over New Year's Eve. Despite never getting everything done that we had hoped to do when we are at home, we are always ready when the time comes to return to our other life. 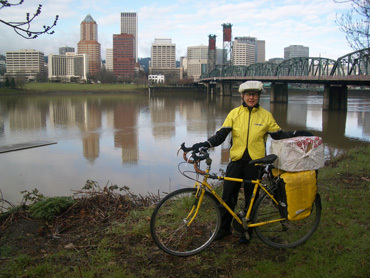 We hoped that our departure would soon rescue us from one of the Pacific Northwest's typically wet and cold winters--we longed to bike and walk without steeling our nerve. And of course, we were quite ready to again put the serious side of life, the health and business matters, on the back-burner and direct our energy into pedaling our bikes and navigating cultural challenges. We were satisfied with what we had accomplished at home, which had included some unanticipated thinning of our stored belongings and preparing to sell the house. And we were pleased to already have decided which boxes of treasured possessions were to be culled next. Our departure morning ritual once again had us washing the sheets and sweeping the floor as we tucked the last of our Stateside belongings away for another 9+ months. 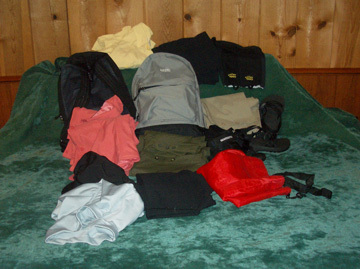 The piles of fabric to be sewn were gone, the growing stacks of gear were now hidden away in the suitcases, the old bikes were hung on the wall with partially deflated tires, and the sewing machines and photo printer were covered to protect them from the dust. Cleaning our living space and then leaving is like putting rowdy children to bed: we hope that they will rest quietly but expect them to be as we left them when we reappear. Those last hours are also a time of gratitude: a time to be thankful for all the circumstances, people, and possessions that allow us to live in 2 worlds instead of 1. After our private goodbyes to our things, we were off, off for another season of discovery. Too bad about those new computer problems but they've given us a new excuse for our webpage backlog. Bill downloaded an instruction manual for the new version of the web page editor while in Tunisia at the end of February, but it's taken all this time to get it up and running. Unfortunately, every old file must be modified so they cannot yet be accessed by you, but be patient, that ability will return soon. We've completed our interesting 3 week visit to Tunisia and are back in Sicily where we've collected our bikes and stashed gear. Sitting out the week-long Easter holiday in Tràpani has given us time to cull those 700+ photos we took in Tunisia, work on the web page, get most of the new parts on the bikes, and merge our piles of gear that were variously stored in Tràpani and Palermo, carried with us, and mailed from a bike shop in Germany. After a rough start in Tunisia, Bill has gained confidence in his ability to connect our laptop to the internet with his new Motorola cell phone, which will facilitate the paper work process for the sale of our home while we are on the road. It also means we'll have more internet access throughout the year, though it will vary from country to country. On Monday, March 24, we'll be on our loaded bikes for the first time in 2008 and heading off for a month-long tour of Sicily. After that, we'll hop a ferry to explore another Italian island, Sardinia. The dry weather in the 60's is threatening to become wet, so it could be rough riding the first few days.